I rather liked this and pinched it from David Didau. Nothing new but a review of the scientific consensus on how we learn and what teachers can do. 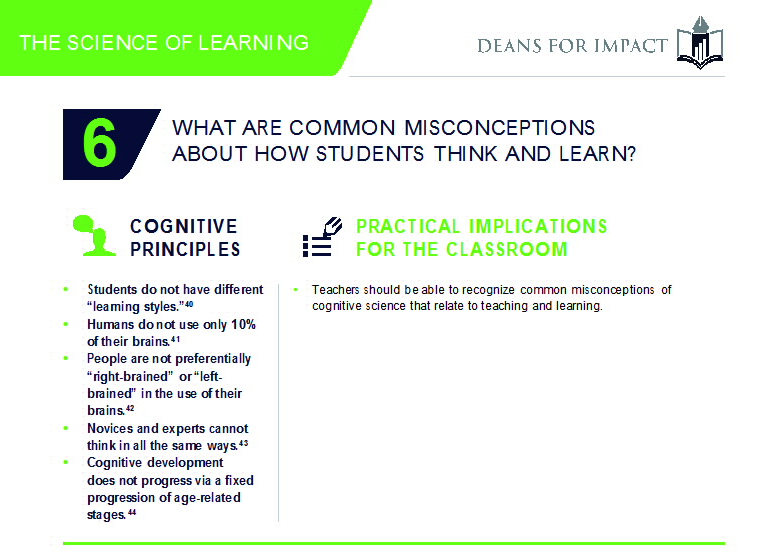 I also loved the misconceptions section and reflecting on how many of those had seeped into my own practice. My PGCE (1999-2000 vintage) seemed to be built around the ideas of VAK learning styles and we all had to create lesson plans and checklists to prove we were engaging the kinaesthetic learner. Thinking back, it really was emperors new clothes stuff. I wonder which of the sacred cows will be slaughtered next? This entry was posted in Uncategorized and tagged cognitive approaches to learning, Pedagogy, Teaching and Learning. Bookmark the permalink. ← 5th October – World Teacher Day!